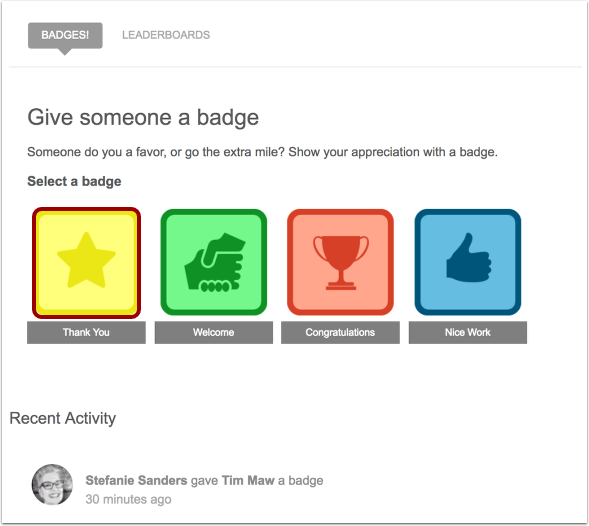 User Badges are peer-to-peer badges in the community. 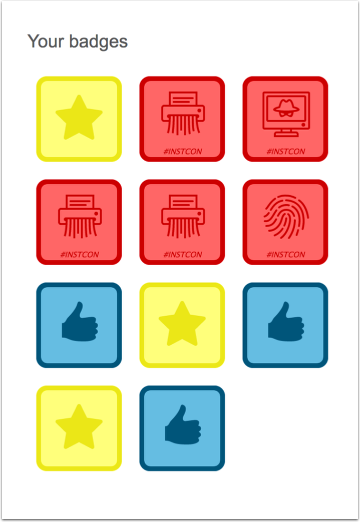 There are currently 4 different types of user badges. Congratulations: Did someone just level-up? Advance to a new role icon? Acknowledge their achievement with a Congratulations badge. Nice Work: When you want to recognize someone's effort or contribution (blog post, comment, answer, idea, etc.) in the community. Thank You: When someone's done something nice and you just want to appreciate him/her. Welcome: See a new member lurking about? Send them a welcome badge and comforting message. Where can I find and award a User Badge? There are five (5) places you can initiate and award user badges to other members in the community. On a user's profile page, click the Actions menu  and then click the Give badge link . Visit the Badge page. To give a badge, click the badge image. 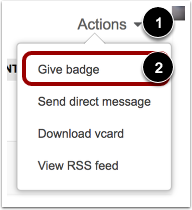 In the Rewards dashboard, you can also click your point total to access the Badge page. In a content item, click the Actions menu  and then click the Give a Badge link . In a comment reply, click the Actions menu  and then click the Give a Badge link . When you @mention a user and hover over his or her name, click the Give a Badge link. How can I send points with a user badge? In addition to awarding a badge to a member in the community, you can also send bonus points. 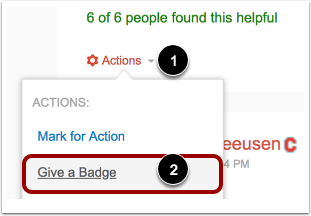 If someone helped you troubleshoot an issue or shared great insights, these may warrant a extra points beyond just a badge. To send points, select the point designation from the slider. Points will detract from your current available points. There are no lifetime points in the gamification system. Giving points away will also negatively impact your current point-level standing in the community. For example, if LEARNER III is 500 points and you have 550 points, giving away 100 points will change your status to LEARNER II with 450 points. The personal messages associated with badge awards and subsequent replies to those messages are visible to everyone in the Community. Where can I see all the badges awarded to me? 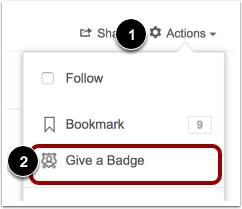 To see the badges you have received and who gave them to you, go to the Badge page. 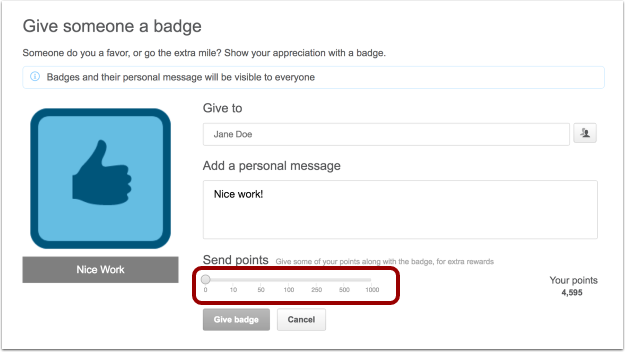 Or, in the Rewards dashboard, you can also click your point total to access the Badge page. Note: To know who gave you the badge, hover over the badge image. Previous Topic:What is the Canvas Community Reward System? Next Topic:What do the different role icons represent in the Canvas Community? 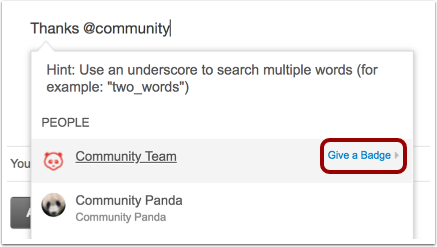 Table of Contents > Community Reward System > How do I give a badge to another user in the Canvas Community?